Viva Las Vegas! Haven't been to Sin City since November when I came with Seattle A-Crew during their 2010 World Series Softball Tournament. It was time to visit with my two favorite Uncles and check out the strip. The flight was a bit rough for me - haven't been on a long flight in awhile and was a little unprepared. I won't go into too many details, but when we got to Vegas I REALLY had to go to the bathroom. We did a little O.J. action through the airport to get outside super fast. After a quick regroup, I'm ready to roll. My Uncles have a fun weekend in store. I'll just leave it there, cause you know what they say.....what happens in Vegas......stays in Vegas. Have a great weekend everyone!!! Whew! March was quite a month! First, we moved out of temporary housing and into a townhouse in Philadelphia. Not long after that, big brother Mickey joined us. About a week later, all of our stuff came on this really big truck. Then I got not just one, but TWO new dog walkers. 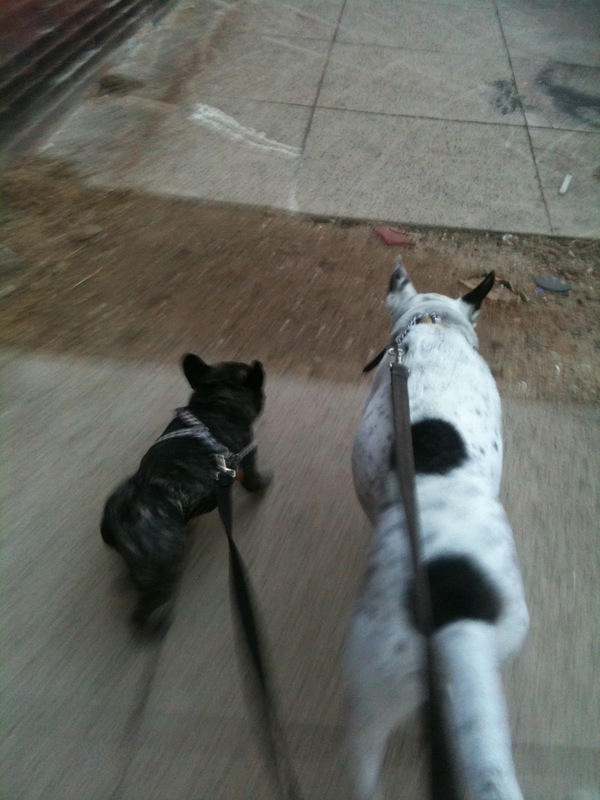 One day after that, I got picked up and taken to day care where I got to play with another Frenchie. Seems like every day something new was going on. Moving out of temporary housing was quite a commotion. It took 3 car trips to move clothes, cats, and me from our little apartment in downtown "Center City" to our new townhouse in the Northern Liberties neighborhood in Philadelphia. I thought it was kinda fun - just another adventure - but the cats weren't quite as thrilled. I quickly made my claim on one of the bedrooms, and gave the cats their choice of two other bedrooms. Of course, my bedroom is also known as the master bedroom, but they don't really need to know that, right? It wasn't long after that when big brother Mickey showed up. 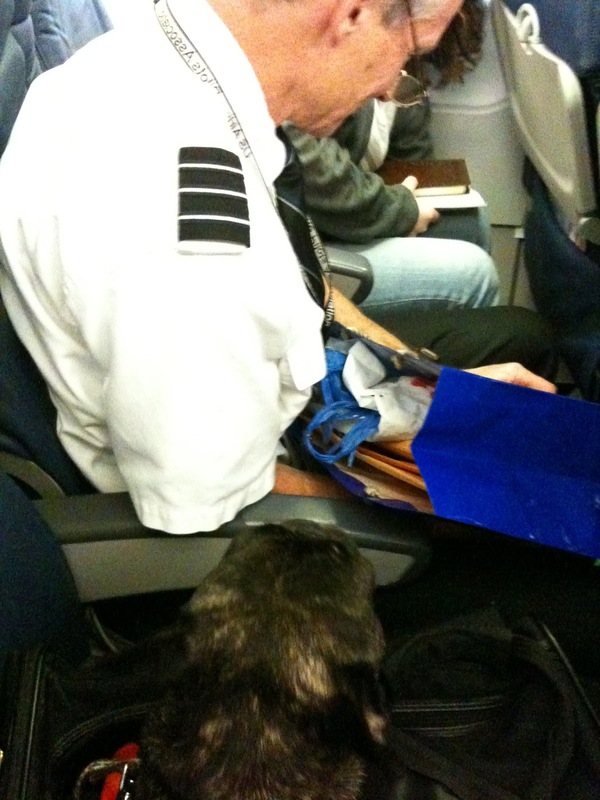 He hadn't ever been on a plane before, and it took a special extra large kennel to get him coast to coast. We had to rent a mini van and drive to New Jersey to pick him up really early on a Saturday morning. I can't imagine flying cargo - my big brother is tough though and was ready to roll from the moment he landed. Big brother and I go for walks together in the mornings and evenings. He wears some sort of contraption around his mouth so that he doesn't get too excited and think I'm a snack. Not sure what all the fuss is about - we do just fine. During the weekdays, we have dog walkers Dan and Kim that come and take us out separately. Mickey goes off to a vacant lot nearby where he can run without any worries, and I get to wander around the neighborhood and say hello to everyone. One day I got a special pickup and got to spend the day at a house with another Frenchie and a few other dogs. It was super fun! Somewhere in there a big truck pulled up and a BUNCH of boxes were unloaded into the townhouse. Jackpot! My toys were here....I had almost forgotten about some of my favorites. I was paralyzed with happiness but pulled it together and made sure my stash was stacked in one area away from the cats and big brother. If you've ever seen Mickey with a toy, it lasts about 4.8 sections before it's ripped to shreds. Seriously, one day we'll have to You Tube it - he'd go viral. So now its April. That's a good thing - it means baseball, the sun starting to come out more, and most importantly its getting warmer outside. I'm ready to ditch the sweaters and sit on the rooftop deck to take in some rays! Happy Spring everyone! Miss all of you on the West Coast. I'll post some more pics soon. One by one they've arrived. First Cybil, then Torino and Sienna. Its feline mayhem around the 'ol corporate apartment. They've totally taken over. 3 on 1, and I'm the 1. My only respite is when my walker comes and gets me outside for a bit. I'm putting out the S.O.S. to my buddies: Sabi, Bodie, Phoebe.....send in some reinforcements! Hooray!!! Its Superbowl weekend! I'm not really sure what that means, but I did get lots of treats for sitting pretty and posing with this hat. Personally, I'll be happy when this whole football thing is behind us. Its a touchy subject, and I'm doing my best to remain as neutral as possible. Abiding by the very good advice 'don't bite the hand that feeds you,' my unconditional loyalties must be with Pittsburgh. Its just a little bit dicey, since I must also remain loyal to my Aunt Lisa and Uncle Rich, both Wisconsin natives who are no doubt pulling for Green Bay. My plan for the day is to sleep as much as possible, cheer for the winners, and console the losers. Good luck to everyone - may the best team win. Here I am in downtown "Center City" Philadelphia. According to the news, we got 16 inches of snow Wednesday evening - alls I know is that the snow is now taller than me. Big huge flakes fell for hours, and there was thunder and lightening mixed in too. We woke up Thursday morning and went outside....the normally bustling streets were eerily empty. The lights were even off at the Dunkin' Donuts across the street. Snowmageddon. We walked around for a bit - it was actually warmer than it had been in awhile. 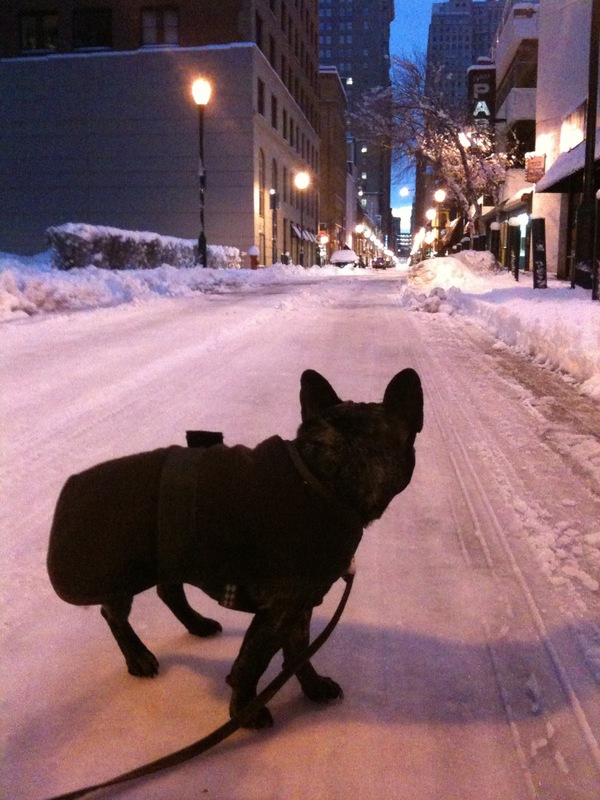 The streets were somewhat plowed, but what was left was super slippery - we had our own private ice rink! We heard an engine around the corner and went to check it out - a guy on an ATV with a snow plow attached to the front plowing the sidewalks. As the day went on, the sun came out and people came outside. I'm on my own with a dog sitter this weekend while mom heads back to Seattle again. Rumor has it my cats are coming to join me! Last weekend was another whirlwind of adventure. We hadn't been able to make it back to Seattle since mid December (Thanks to the 'Blizzard of 2010' - see earlier post), so we hopped a plane back to the Northwest this past weekend for a quick couple of days. The goals were simple, yet significant: pack my toys and say hello to my kitties. 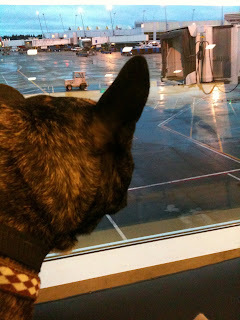 As this was my first trip to the Philadelphia airport, we got there plenty early to check things out. I was very impressed with their pet area, although the foot of snow made it difficult to give it a thorough run down. Even with the wintery conditions, I can say its my second favorite airport pet area, right below Palm Springs. It was also my first flight on US Air. Its seemed ok to me, but I heard my mom say something about wishing we were flying Alaska. I was pretty tired and slept for most of the flight, and when we got off the plane I knew right away we were in Seattle. Rain! I never thought I'd be happy to see rain. And it was warm enough to not wear a sweater or my wool jacket. Saturday and Sunday were all about playing with my kitties and staying out of the way of all the commotion. I made sure that my toys made it into the pile of stuff the movers would bring to Philly. It was great to be home, although I wish there had been time to see my buddies at the Amazon. I'm sure they wouldn't believe that my new job is sleeping on the couch, watching ESPN, and hanging out with the dog walker for a bit. The flight back on Monday was a bit different. The gentleman in the seat next to us was actually a pilot! I was able to get this quick picture of the two of us before I got in trouble for being out of my bag. It was a good thing it wasn't his turn to fly the plane, cause he slept the whole flight! Back in Philly, its been another relaxing week. I hear we're going sightseeing this weekend, as long as we don't get too much snow. I'm hoping we get to try a Philly Cheese steak before too long! Happy New Year!!! We headed to Philadelphia on New Years Eve and got settled into our apartment downtown. Its not home but I'm told its just for a little while until we find a place where there's room for my kitties and all of my toys. 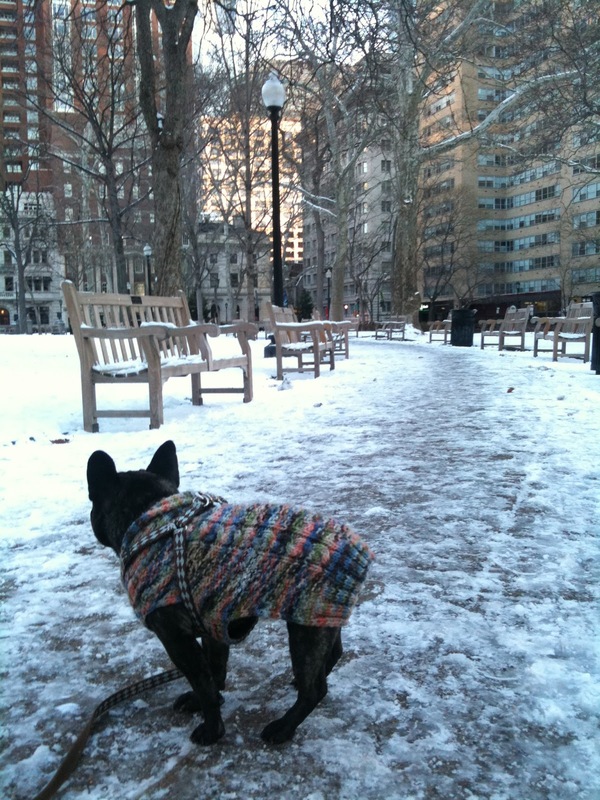 The place is just a few blocks away from this cool old park called Rittenhouse Square. 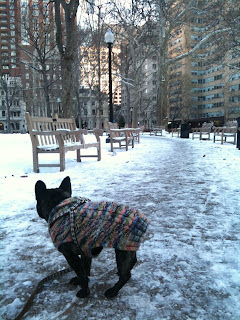 The picture here is from Rittenhouse last weekend early in the morning when we were up before any of the other dogs. Philadelphia has alot of really old buildings and statues - I haven't seen the Liberty Bell yet but stay tuned. Hope everyone is staying warm and enjoying the New Year! I'd like to get a special shout out to all of my friends at Amazon. There's been a steady stream of Amazon boxes showing up here at the apartment, and they usually have something for me inside. (Editor: and no sales tax! Keep up the good work).